Saturday night I went with my sister Marijke to the movie Maze Runner the Scorch Trials. 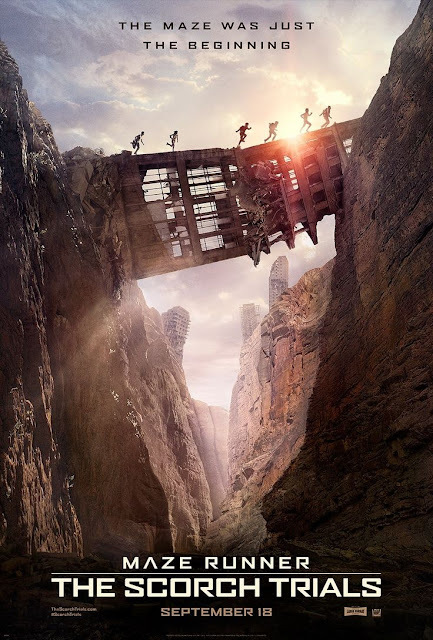 Last year I went to the Maze Runner and had no idea what the movie was going to be like. I had no idea it was a series because I’d never heard of the books before. So when I saw it with my other sister Inge last year I was so angry that again I was tied to a series. I mean, I was then bound to: The Hobbit, The Hunger Games and the Divergent series. And now this one again?! But I’m very glad I went last year and this Saturday I went to the Scorch Trials. The movie started and there is no time to get into the movie. It literally is: the cinema gets dark and it starts. No time to think. The first movie ended with the helicopter and this movie starts at that point. No introduction, so I strongly recommend to watch the first movie again before you go and see this one if you don’t remember the story very well after a year. Then there are like a thousand scary moments in the film. I’m not a hero, especially when I’m watching a movie I’m the most scared person in the cinema. And my sister is just like me, and we both joked we were on special ‘jump’ chairs. Because we kept being scared and we jumped up in our chairs of shock moments. We joked a lot about it, because of the constant tension (is that the right word?) in the movie. We both loved it so much. My sister got some clues that I missed through the movie but explained to me later. And really I love this movie. I want to see it again and again. I’ve seen the Maze Runner for like 4 times and I think I’m going to watch the Scorch Trials a lot also. But I love the movie and how the actors acted. The pain, fear and the loss of some persons I could feel. I’m totally devastated by some things in this movie. Oh and can Dylan O’Brien get evem hotter? Really that's a big plus for me in the movie ;) So I hope to see him as Thomas and the rest of the Gladers next year on the big screen! I can’t wait and hate that I have to wait so long again for the next movie. I’ve told myself, I let myself surprise by not reading the books. I like to read the books afterwards and watching the movies first. I know, that’s weird. I do it sometimes. Not always. But with this series I'm doing it. I really recommend this movie to everyone. And if you haven't seen the Maze Runner. Go watch it. I loved both movies and was completly drawn into to the movies and didn't hear anything around me because I was so focused which is a really good thing! Have you seen the movie? Did you like it too?